Simple farmhouse decor is a popular style for kitchens. If you’re not a designer yourself it can be hard to pick accessories that go well together and are functional. 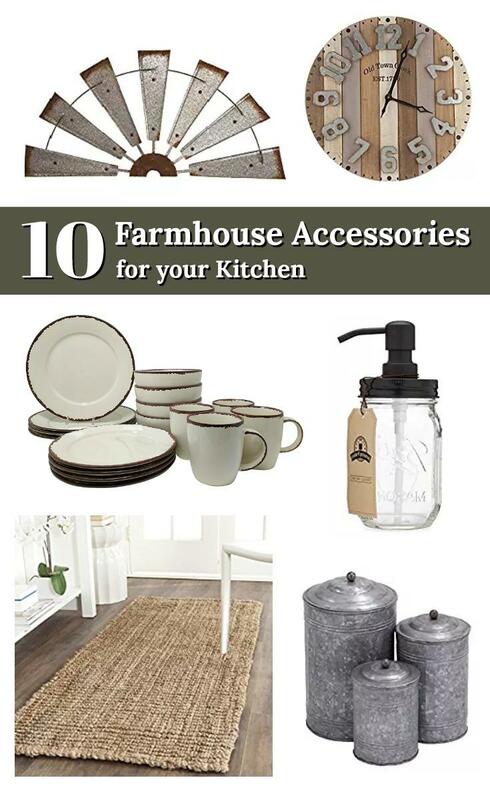 I’m sharing my top ten picks for farmhouse style kitchen accessories to make your decorating job a little less stressful and a lot more fun! Farmhouse wall decor is a must have for any farmhouse styled home. Vintage farm tool parts and short word signs are a popular choice. This galvanized steel windmill wall decor looks great mounted above a kitchen window and adds some vintage farmhouse charm. Welcome guests to your home with a simple custom sign featuring your family name. Combining two of today’s top style trends in one piece, this wall clock will fit seamlessly into many different design themes. The iron clock frame boasts mid-century modern design inspiration. Backing the clock is a reclaimed style solid wood frame, giving this piece an industrial farmhouse appeal. Add a simple buffalo checked valance above your farmhouse sink. A great way to get conversations started is with a small collection. Feature your vintage salt n pepper shakers or reamer collection on these torched wood shelves. Store coffee, tea, or baking ingredients in these stylish galvanized steel canisters. Tie the room together by adding this set of planters to your windowsill. Add herbs or low maintenance succulents for a pop of color in the room. Every little detail matters in a well-styled room. Pour store bought liquid soap into this mason jar soap dispenser for an eye catching accessory. Serve guests with this 16 piece rustic farmhouse style dinnerware set. Add a natural fiber table runner and use the galvanized steel planters as a centerpiece. Farmhouse style decor isn’t just for walls and countertops. Add a little cushion and style to your floor with a natural fiber rug. Creating a functional and beautiful space is easy once you’ve found the perfect accessories. Enjoy your farmhouse kitchen!